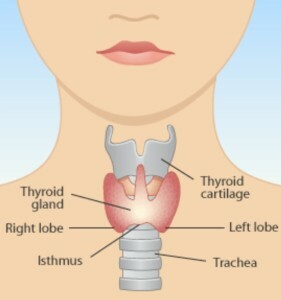 The thyroid gland is a butterfly shaped endocrine gland that is normally located in the lower front of the neck. Thyroid hormones are produced by the thyroid gland. This gland is located in the lower part of the neck, below the Adam’s apple. The gland wraps around the trachea (windpipe) and has a shape that is similar to a butterfly – formed by two lobes (wings) and attached by a middle part (isthmus). The thyroid gland uses iodine (mostly available from the diet in foods such as seafood, bread, and salt) to produce thyroid hormones. The two most important thyroid hormones are thyroxine (T4) and triiodothyronine (T3), which account for 99.9 per cent and 0.1 per cent of thyroid hormones present in the blood respectively. However, the hormone with the most biological activity is T3, once released from the thyroid gland into the blood, a large amount of T4 is converted into T3, which is the active hormone that affects the metabolism of cells. Thyroid hormone is carried through the blood to every tissue in the body, where it is essential to help each cell and organ to work correctly, for example, thyroid hormone helps the body use energy, stay warm, and keep the brain, heart, muscles, and other organs working as they should. Hypothyroidism is an underactive thyroid gland. Hypothyroidism means that the thyroid gland cannot make enough thyroid hormone to keep the body running normally. People are hypothyroid if they have too little thyroid hormone in their blood. Low thyroid hormone levels cause the body’s functions to slow down, leading to general symptoms like dry skin, fatigue, loss of energy, and memory problems. Thyroiditis: Thyroiditis is an inflammation of the thyroid gland, usually caused by an autoimmune attack or by a viral infection. Thyroiditis can make the thyroid release its entire supply of stored thyroid hormone into the blood at once, causing brief hyperthyroidism; once all of the stored hormone has been released, the thyroid becomes underactive. Insufficient iodine: The thyroid gland must have iodine to make thyroid hormone. 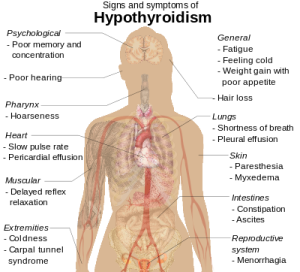 Iodine comes into the body in foods, includ- ing dairy products, chicken, fish, and salt. The symptoms of hypothyroidism are often subtle. They are not specific and are often attributed to aging. Patients with mild hypothyroidism may have no signs or symptoms. 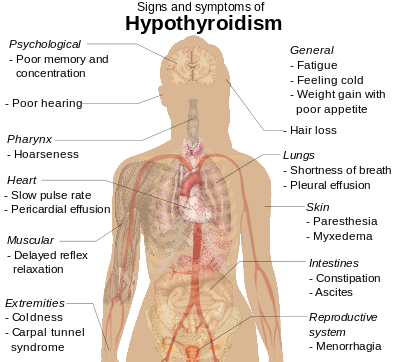 The symptoms generally become more obvious as the condition worsens and the majority of these complaints are related to a metabolic slowing of the body. Most will have a combination of a number of these symptoms. Occasionally, some patients with hypothyroidism have no symptoms at all, or they are just so subtle that they go unnoticed. Advanced first aid training – online!